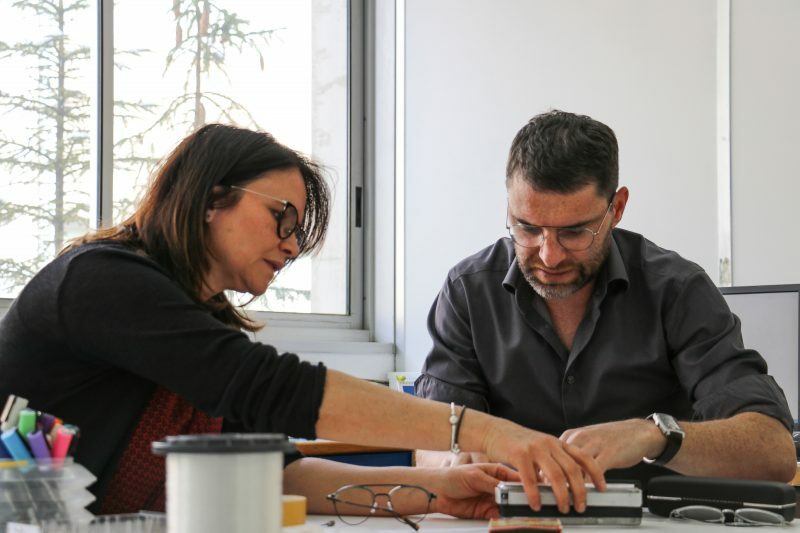 Morel’s creativity lies in innovation: a constant search for new techniques and materials. Leather is a premium, high-quality material. 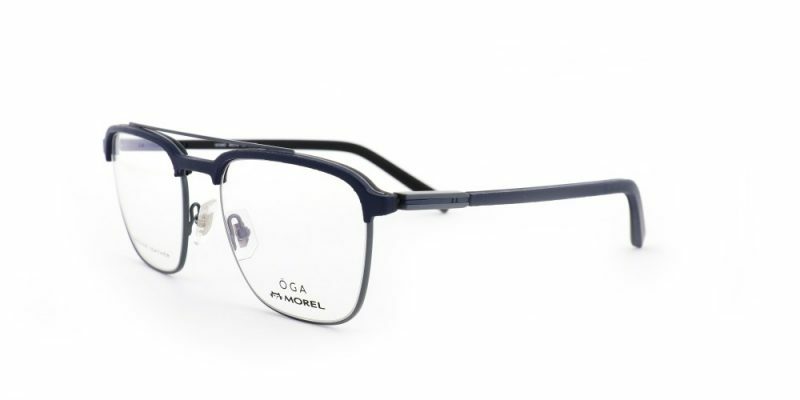 It evokes a particular aesthetic and expertise, requiring a high-precision of craftsmanship. 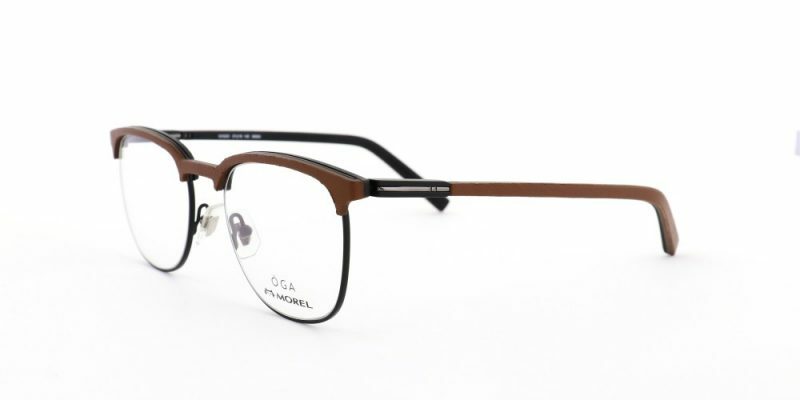 Morel guarantees the use of the highest quality leather combined with a unique production process for every frame. 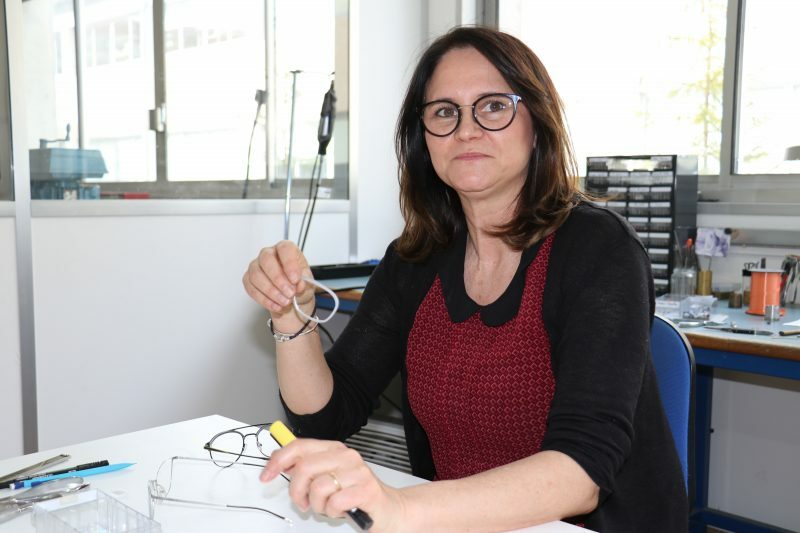 Valérie Prillard, awarded “meilleur ouvrier de France” and prototypist at Morel was in charge of creating the prototype. 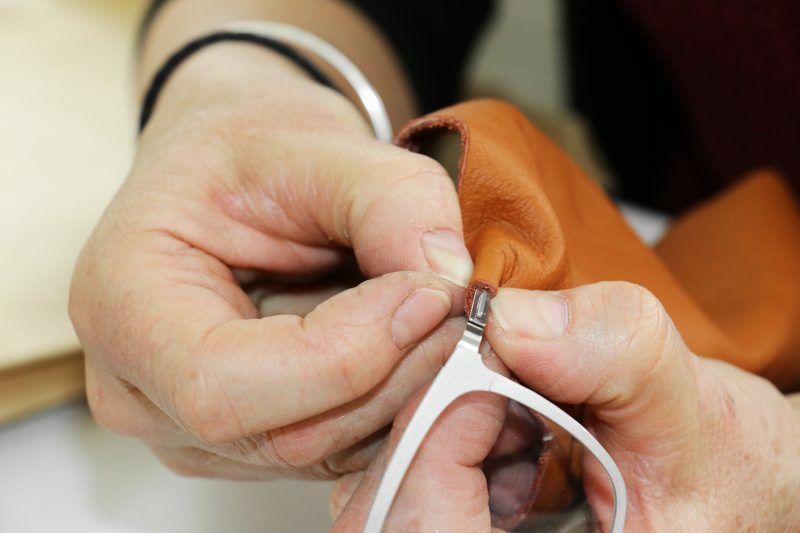 To learn more about Valérie and her experience with leather, we interviewed her in her workshop. 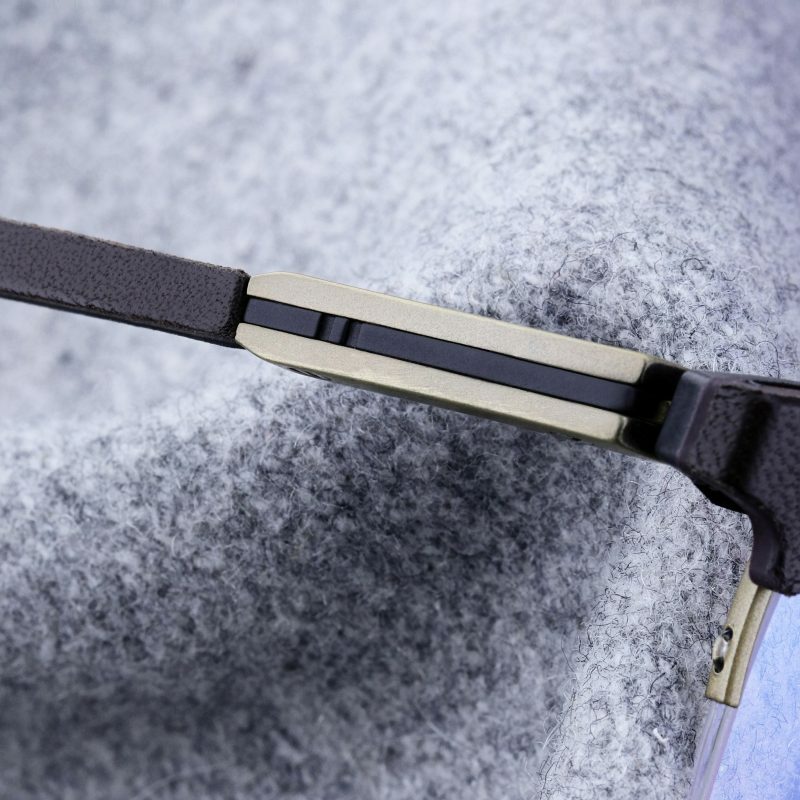 What was your first reaction when the designers asked you to work on a pair of leather frames? Valérie : I’m always thrilled when new materials appear, so I was happy about the idea of working with leather. V : No, absolutely not. I love a challenge. At first glance, what makes it different to work with such a specific material? V : Actually, when you compare it to metal for example, the texture is very significant. I enjoy working with this material. It’s soft and flexible, which makes working with leather so pleasant. Have you run into any surprises while working with leather? V : One of the challenges was working with the thickness of the leather. I needed very precise dimensions for the prototypes. I ended up having to tan the material myself. When the leather is too thick, I can’t make it do what I want; it’s difficult to coax it into certain shapes. Here are a few samples I brought from home. I tanned them with a huge file, which allowed me to remove material from the inside and reduce the thickness as much as I needed. This made it much easier to fit it around the temple. Leather is a material that comes from nature; did that create any complications for you? V : In the beginning, the designer wanted to work with certain leathers that had interesting irregularities. He quickly realized that we were going to have to use more uniform skins, both to duplicate the design on every frame and to make the frames durable. We understand that leather is a natural material therefore; the designer chose to work with a resistant type. Is this the first time you’ve worked with leather at Morel? V : No, a long time ago another designer asked me to work on a leather frame, but it was never more than a prototype. 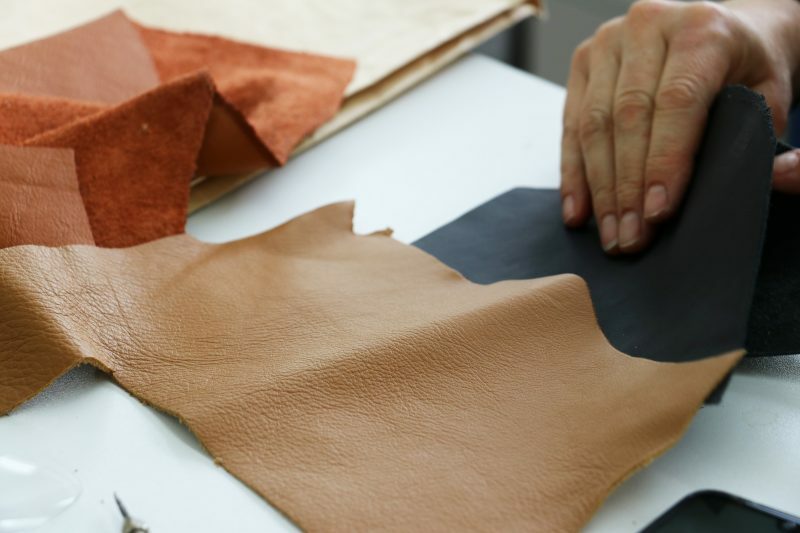 At the time, even though it was just as possible to make leather prototypes as it is today, implementing a production model was a different story. Manufacturing techniques have advanced since then, which makes it possible for us to carry-out projects like this one. We were lucky to find a vendor who is able to prepare leather that meets our standards of quality, which wasn’t the case before. The hard work of Valérie and the designers paid off; their prototype is now in production. 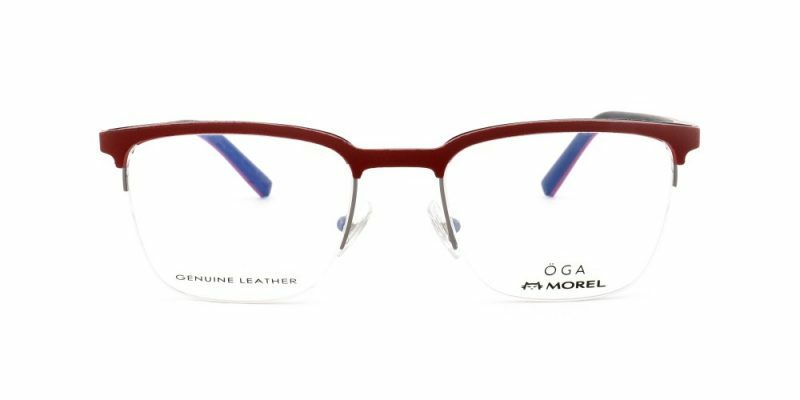 Morel‘s leather frames are part of the Öga collection, with a total of four models in several colors.